Carlos Wizard Martins is an English professor who made his fortune by teaching Brazilians a second language. His company, Grupo Multi (Multi Group), is the market leader in Brazil’s booming language teaching industry. In December 2013 he sold his company for $719.6 million in cash. 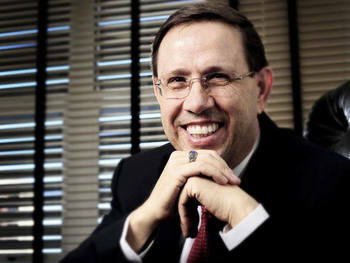 In 2013, Forbes magazine added him to its list of the richest Brazilians. He is a member of The Church of Jesus Christ of Latter-day Saints. Martins was born in Curitiba, Brazil, in 1956, and was raised in poverty. The family joined the Church when he was 13. He started taking English lessons with LDS missionaries. Encouraged by the missionaries, he traveled to the United States when he turned 17 (paying for his fare in 10 payments) and took a job in New Jersey as a waiter. At age 19, he then served as a full-time Mormon missionary to Portugal and returned to Brazil after completing his mission. Back in Brazil, he married Vânia Pimentel and they returned to the US, where Martins received a degree in computer science and statistics from Brigham Young University. While at BYU, he taught at the Missionary Training Center of the Church of Jesus Christ and saw how quickly a person could learn a language. After he graduated, they moved back to Brazil and Martins supplemented his income as a paper company executive by teaching English to a coworker. Soon other students joined him to learn English. His wife started teaching to help keep up with the demand, and eventually he was making more money teaching English than he was working at the paper company. At age 30, he quit his job at the paper company and used his savings to start a language teaching school that he named Wizard after the movie “The Wizard of Oz.” With the motto, “Speak English in 24 hours,” he grew his business through franchises, and accomplished his goal of opening a school in each of Brazil’s state capitals. His school became the fastest-growing English learning school in Brazil. As a tribute to his original school chain, he legally gave himself the middle name of “Wizard.” He has helped dozens of Brazilians become millionaires through franchising his business. While serving as a mission president, his twin sons created Multi Group. His company has expanded beyond Brazil and has schools in the United States, China, and several other countries worldwide. Martins also owns a gift card company in Brazil, a real estate company, and a company similar to Paypal. He is also the author of two books, Vencendo a Propria Crise (Overcoming Personal Crisis) and Desperete o Milionário que há em Você (Awaken the Millionaire Inside of You). His biography, Carlos Martins: Dreams Have No Limits, was written by Ignácio Loyola de Brandão. Martins and his wife have six children and twelve grandchildren. This page was last edited on 3 November 2014, at 20:20.